A Michigan judge said Thursday he will decide in the next few months whether to make public internal documents from Ford Motor Co. and its Volvo subsidiary that have been used in several rollover "roof crush" lawsuits. The documents show Volvo engineers determined that roof strength is a key factor in passenger safety in rollover accidents, while Ford has taken the opposite view in court cases. 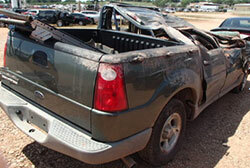 Ford and other automakers are facing hundreds of lawsuits stemming from rollover accidents where vehicle roofs caved in. Some have resulted in large verdicts against Ford. Some of the documents were posted on a federal Web site before being removed, while others have been obtained by The Detroit News and other media outlets from court files following lawsuits. The National Highway Traffic Safety Administration is reviewing a proposed standard to require automakers to improve the strength of vehicle roofs to protect passengers who are in rollover accidents. That standard is not expected to be finalized until the end of the summer. Bob Tyler, a Southfield attorney representing the family of Christine Glaeser, who died in a 2000 rollover accident in a Ford Explorer, said making the documents public could save lives. -- and these documents could help make the case." Ford and Volvo said the documents revealed proprietary information and their release could aid competitors. Ford said all of the documents have been given to NHTSA, which agreed with the decision to keep them sealed. The documents, which include a deposition from a Volvo engineer, relate the company's internal testing and other trade secrets. The company gives them to attorneys who sue and have a demonstrated need for them, Ford said. A Bay County jury found Ford liable in Glaeser's death, but didn't award any damages. Bay County Circuit Court Judge William J. Caprathe said the jury's decision was flawed and ordered a retrial set for July. Ford has appealed to block a retrial. After the day-long hearing over whether to keep about 10 documents confidential and a Volvo engineer's deposition secret, Caprathe gave Ford three weeks to file briefs. Both sides can then file another round of arguments before he makes a final decision. Glaeser and her husband were driving north on I-75 in Bay County on the start of a vacation on July 29, 2000, when a tire on their recently leased 2000 Ford Explorer blew out, causing the vehicle to roll. Glaeser, 48, a mother of four, was wearing her seat-belt restraint at the time of the accident and the vehicle was traveling about 50 mph. Tyler introduced as evidence a number of internal Ford and Volvo documents that he said show that alternative roof designs that prevent roof collapse were in use in both Ford and Volvo vehicles prior to the accident. Ford has sought to keep the Volvo documents sealed in other lawsuits in Texas and Florida.